"Melatonin is the all-natural nightcap. It's secreted by the pineal gland, a pea-size structure at the center of the brain, as our eyes register the fall of darkness." 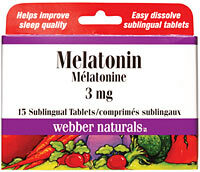 At night melatonin is produced to help our bodies regulate our sleep-wake cycles. The amount of melatonin produced by our body seems to lessen as we get older. Scientists believe this may be why young people have less problem sleeping than older people. The appropriate dose can vary enormously from person to person. For example, we offer tablets of 1.5 mg and 3.0 mg. Start off with a 1.5 mg tablet each night before bed-time, and work your way to larger doses if needed. Women who are pregnant or nursing (since no one knows how excessive exposure to the hormone might affect a fetus or infant); people with severe allergies or autoimmune diseases (melatonin could exacerbate such conditions by stimulating the immune system); people with immune-system cancers such as lymphoma or leukemia (for the same reason), and healthy children (who already produce it in abundance). Women trying to conceive should also think twice about taking the hormone, since high doses can act as a contraceptive." As with any substance introduced into your body, if you have a medical condition you should always consult your physician first before taking melatonin.